North Forest community members recently voted to reject the Wayside Village project to build 1600 homes in Northeast Houston. 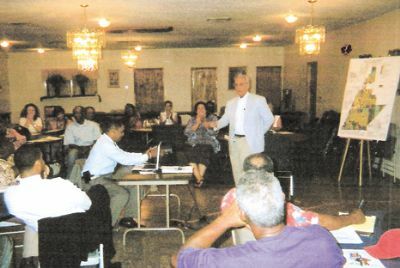 Super Neighborhood 47 held a community Townhall meeting on Monday June 26 to discuss a planned vision for Northeast Houston and the proposed Wayside Village Project by Woodmere Development at N. Wayside and Little York. More than 75 residents came out to voice their concerns. Houston City Councilmen Jarvis Johnson and Peter Brown were invited and present. Woodmere Development was invited but did not show. Councilman Peter Brown presented examples of ideal community development plans that have worked very successfully in communities similar to the communities in Northeast Houston. It was very empowering and informative and helped the audience to more intelligently choose wise development and examine the Woodmere plan. On this night the community unanimously rejected the Woodmere development plan layout to build 1600 homes and its proposed MUD tax for water utilities. More taxes in an already overtaxed community were unacceptable and would take away affordability for many home buyers. Additionally, there were no planned or impact studies done on education, environmental and community sustainability for the surrounding communities. Property values, taxes, flooding, crime, education are major concerns of the community and were not addressed by the Woodmere plan. The consensus for the betterment of the whole community was all extensive development should seek to be on the same page with the planned blueprint and vision of the community. We are taxed and some of those who access our tax dollars evade the taxpayers? Invading a community with development and evading the taxpayers with information is bamboozling the people, said Ivory Mayhorn a member of Super Neighborhood 47. Councilman Jarvis Johnson stated that he stands by the people and would surely help in bringing in development that works for the real needs of the community at large. Community development does not necessarily mean community growth. Jarvis addressed the principal challenges facing Northeast Houston as. 1) long term economic deterioration in the basic infrastructure of the area and decline of the tax base and lack of wholesome amenities, affordable housing, and central areas for business expansion; 2) high rates of unemployment, 3) disjointed and unfocused community development initiatives 5) courses to take for community self-help 6) impediments to housing development and commercial growth; and 7) lack of responsible community development that ignores the needs of the community and stated that efforts to meet these challenges would be met. With the implementation of its vision planning, Super Neighborhood 47 seeks to achieve a balance in economic and community development said Robin Curtis, President of Northeast Beyond 2000. The community plans to conduct feasibility analyses to provide recommendations for appropriate land use and retaining opportunities in development. Efforts to keep the communities informed and participating in the implementation process include focusing on the interrelationships between community needs and a variety of connected programs rather than on narrow. single-purpose programs where the developer is here today and gone tomorrow without a connection to the whole community. The next vision planning session will be addressed in the July meeting. All Superneighborhood 47 meetings are on the 4th Monday of the month.The Next meeting is Monday, July 24, 2006 at 7:00 p.m., Greater Oak Grove Baptist Church 9829 Sandra St at Polly (near Shadydale Elementary) Houston, Texas 77016. The whole community is welcome. Veterans of the VietnamWar and their families gathered last weekend at Brookside Memorial Park on US59, to reflect on their experiences in the war and honor those whose names appeared on the replica of the monument, whose original is on the Mall in Washington D.C. Among the veterans on hand were many Vietnam vets, and those of other wars also. The occasion was a solemn time to reflect on experiences and values of soldiers of all times and places. Veteran Vincent Cantu, and his comrade Nathan Harvey, fought in 1965 in the battle of Ia-Drang Valley. Specifically, it was at Landing Zone XRAY. This is near the Vietnam/Cambodia border, and has been characterized as a pivotal early battle in the war. One of the most savage and significant battles of the war. Cantu was awarded a Bronze Star for his bravery in this battle, and a book and movie, entitled We were Soldiers, Once and Young, by Lt. Gen. Harold Moore and Joseph Galloway, was written about this battle. The movie starred Mel Gibson and Sam Elliott. A picture of Cantu carrying a wounded soldier was widely circulated at the time. Cantu now lives on Mt. Houston Road in Northeast Houston. Other local soldiers on hand included Carlos Garzos, a member of the Golden Dragons 25th infantry unit. The Vietnam Wall Memorial is a traveling, three-quarter-scale replica of the Vietnam Veterans Memorial in Washington, D.C. It was at Brookside Memorial Park July 7 through July 9. Since its dedication in 1982, the permanent memorial in Washington, D.C. has evoked tears, pride and sympathy among the millions who have visited it. Dignity Memorial funeral, cremation and cemetery providers created this powerful memorial as a service to those who may never visit the nations capital to see The Wall firsthand. The exhibit crisscrosses the country each year, allowing millions of visitors to see and touch the black, mirror-like surface inscribed with the names of more than 58,000 Americans who died or are missing in Vietnam. 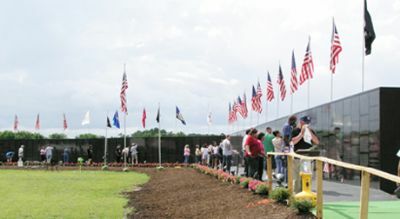 Honoring all U.S. veterans and dedicated to Vietnam veterans, the faux-granite replica is 240 feet long and eight feet high. Great measures have been taken to ensure the spirit and integrity of the Dignity Memorial Vietnam Wall. The purpose is to honor veterans by bringing this 240-foot replica to the communities. Dignity Memorial provides the replica to communities at no cost. A chemical spill near Aldine Mail Route last Wednesday afternoon caused the evacuation of 200 employees from Nailor Industries. State troopers and Harris County Sheriffs deputies closed several streets around businesses. 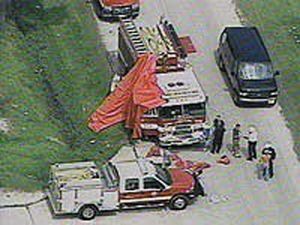 The problem was caused by an employee unloading a supply truck. A forklift was being used to move pallets laden with 55 gallon drums. The forklift operator accidently punctured one of the drums and 40 gallons of hydrobromic acid spilled onto the warehouse floor. Two employees suffered burns and 40 others were taken to area hospitals with respiratory problems. Some workers had to be sprayed down and put on jumpsuits. The other 200 employees who were evacuated waited on METRO busses brought to the site to provide a cool resting place during the clean up. Nailor Industries is a heating, air conditioning, and plumbing contractor. They manufacture hardware for environmental regulators, blowers and fans. Harris County HazMat controlled the release of the chemical and contained the spill. Investigators believe the spill did not affect areas outside of Nailor. 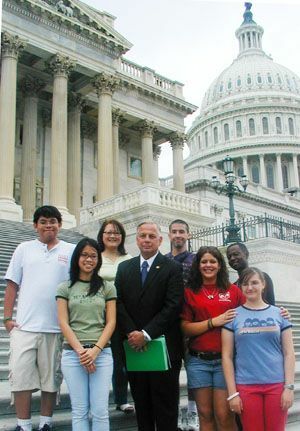 Aldine ISD winners of the History Fair, William Trotty from Carver High School, Alejandro Reyes from Drew Academy, Deborah Le from Eisenhower High School and Kaitlin Barnes from Teague Middle School, visited with Congressman Green during their visit to Washington, D.C.
Houston beat out Detroit and Atlanta to be named as the number six High School Hoop City in the nation in SchoolSports Magazines summer issue. Aldine Highs own forward Gary Johnson is one of the top players in the class of 2007 to cause Houston to earn this honor. Houstons best local stars continue to make up some of the nations top recruits. Houstons hoop game has exploded into national prominence in recent years. 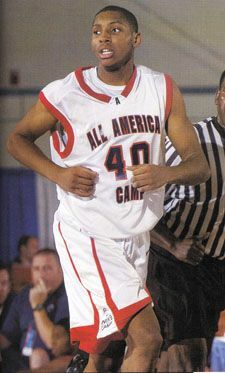 The Class of 2007 includes forwards Gary Johnson of Aldine (Houston, Texas) and DeAndre Jordan of Episcopal (Bellaire, Texas). Three of the areas other top rising seniors are Bellaire (Bellaire, Texas) teammates Jai Lucas and Isaiah Rusher and Kingwood (Kingwood, Texas) forward Mike Singletary. SchoolSports Magazine Top High School Hoop Cities are: 1 Philadelphia; 2 New York; 3 Chicago; 4 Los Angeles; 5 Cincinnati; and 6 Houston. This is not the first time Johnson has been featured in a national magazine. Punks magazine included Johnson in its Players Club list.